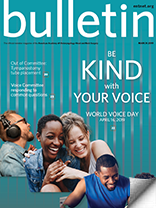 To recognize World Voice Day on April 16, the Voice Committee developed the theme, “Make a Choice, Cherish Your Voice.” Committee members offer responses to patients’ common questions on just how to care for and respect one of our most used relationship tools: our voice. 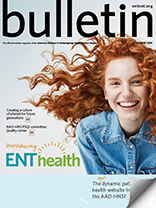 Featuring questions by Lyndsay L. Madden, DO, with answers by James J. Daniero, MD; Priya D. Krishna, MD; Norman D. Hogikyan, MD; Melissa M. Mortensen, MD; and Craig R. Villari, MD. Q: I am a smoker. What exactly does smoking do to my vocal cords and why should I stop? A: James J. Daniero, MD: Tobacco is both an airborne irritant and chemical carcinogen. Therefore, in addition to the direct cause of tobacco smoke leading to throat cancer, repetitive irritation produces generalized inflammation resulting in a poor voice quality that can be permanent. The vocal cord lining replaces itself every five days; however, tobacco leads to accumulation of mutations within the precursor cells. This accumulated damage produces abnormal thickened vocal cord tissue and dysplasia (precancerous cells). Further injury can lead to squamous cell carcinoma, a very aggressive form of cancer affecting the throat lining. Therefore, quitting smoking can reduce the accumulated damage and limit the associated cancer risk. In addition to the risk of cancer, the chronic non-specific inflammation can, over time, lead to specific vocal cord changes, such as permanent vocal cord swelling (called polypoid corditis) and thickened vocal cord lining (called leukoplakia and hyperkeratosis). These changes require surgery to correct them and have the potential to recur. Quitting smoking immediately is the best way to prevent the occurrence/recurrence of these changes. Q: What is the role of a speech pathologist in the care of my voice disorder? A: Priya D. Krishna, MD: The speech pathologist plays a very central role in the care of your voice disorder. The speech pathologist will help in the initial diagnosis and assessment of your voice disorder, frequently in combination with a laryngologist. Speech pathologists have special training in evaluating your voice use and your overall vocal functioning. For the majority of voice disorders, the speech pathologist is also the key clinician involved in the treatment of your voice disorder through voice therapy, especially if the disorder arises from phonotrauma (trauma to the vocal folds from overuse, misuse, or abuse of the voice). He or she is also able to refer you to other appropriate healthcare professionals if medical or surgical evaluation and treatment is needed. Q: My voice is hoarse. Does that mean I have acid reflux? As a laryngologist, I know there are many different potential causes of dysphonia, and the diagnostic process should include a thorough history, a vocal capabilities assessment, and a detailed laryngeal examination. Additional diagnostic tests can also be performed as needed. Having said that, though, a particular diagnosis can only be rendered if it falls within the universe of diagnoses known to the evaluating clinician. 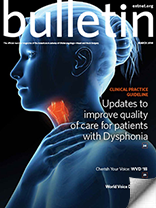 Most every clinician has heard of reflux and knows that it can cause dysphonia. 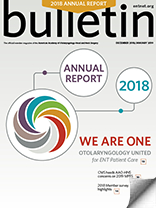 Many other possible etiologies of dysphonia are unfamiliar to primary care physicians, and in some cases to otolaryngologists who do not practice laryngology. If you couple lack of familiarity with an evaluation that is absent of key elements of the diagnostic process for voice patients—such as vocal capabilities assessment or endoscopy—you have a recipe for over-diagnosis of reflux. Q: I am a singer. What are some things that I can do to ensure my voice stays healthy throughout my career? A: Melissa M. Mortensen, MD: 1. Think of yourself as a vocal athlete. Just like an athlete, it is important for a singer to receive the proper training regarding technique and use. It is important to not overuse the voice. It is important to get plenty of rest, eat a well-balanced diet, and get plenty of hydration. Just like professional athletes who spend hours perfecting their abilities, it is important for the singer to have the same disciplined practice schedule with intervals of rest and recovery to perform at an optimal level, regardless of genre. 2. Warm up. Just as the athlete stretches, it is important to have exercises to stretch out your vocal muscles, or warm up. Every singer always needs a good vocal warm-up before they sing. Whether practicing or getting ready to go on stage, a good warm-up is vital. Many new or inexperienced artists risk doing permanent damage to their vocal folds because they are unaware of the importance of doing a warm-up before they sing. 3. Hydration, hydration, hydration. It is important to be well-hydrated for any singer. Drinking non-carbonated and non-caffeinated drinks helps the mucous that coats the vocal folds to act as a lubricant. Most experts recommend plenty of water daily to ensure this. Otherwise, you could find yourself with a dry, scratchy throat, the need to clear your throat more often, and needing more effort to use your voice. 4. Be an original. You want your voice to be the next big thing and not be a copycat. Trying to imitate another singer’s style could put undue pressure on your vocal folds, and you may then sing or do things outside of your comfortable physiologic range or current vocal skill level. This could result in vocal injury. Let your style speak, or sing, for itself. 5. Optimize your schedule. Just like an athlete before the big game, you should not cram all your preparation for your shows and auditions at once. An athlete would not try to prepare for the big game by practicing all in one day, and neither should you. You should sing in small increments daily, about 30-45 minutes, until you have worked on building your muscular skill and stamina. As you improve, you can increase the length of time and vocal difficulty of the pieces you are practicing. 6. Avoid activities that cause trauma to your vocal folds. These include the obvious such as yelling and screaming, and the not so obvious, such as prolonged speaking, speaking loudly, and singing loudly for prolonged periods of time. All of these activities cause the vocal folds to bang together at a higher velocity. The immediate impact can be vocal fold swelling and irritation. The long-term impact can be vocal fold nodules. 7. Avoid alcohol and smoking. Smoking causes your vocal folds to be irritated. Constant irritation can lead to vocal fold edema, which can lead to phonotraumatic problems. Alcohol can cause dehydration of the vocal folds so they don’t vibrate effectively. Both alcohol and smoking can predispose you to acid reflux, which can cause further swelling and injury to the vocal folds. Q: As I get older, I feel as if I am losing my voice all of the time. What could be going on and can it be stopped? A: Craig R. Villari, MD: There are many potential causes for these voice changes, but one of the most common is a normal thinning of the vocal folds that occurs with age. As the vocal folds lose bulk over time, their ability to vibrate against one another becomes impaired. This gap that forms between the vocal folds creates a leaky valve that allows air to inefficiently leak through the voice box, often resulting in decreased loudness and a weaker, breathy voice quality. The most important step in addressing this concern is appropriate workup, including examination of the vocal folds themselves. The vocal folds are often visualized with a common in-office examination called a laryngoscopy. This exam is performed with a mirror, a flexible camera introduced through the nose, or a rigid telescope introduced through the mouth. A special adjunct to this exam, called stroboscopy, can be used during laryngoscopy to more precisely assess the bulk of the vocal folds and their ability to vibrate against each other. These exams are essential for both confirming the suspected diagnosis and ruling out other, more concerning causes for voice changes. Once the diagnosis is established, the focus can be turned to treatment. Treatment usually consists of voice therapy, vocal fold augmentation, or a combination of the two. The goal of these treatments is to increase the efficiency of vocal fold contact while voicing. With voice therapy, a speech language pathologist will create an exercise regimen for the patient to practice outside of therapy sessions; this is often done over a period of several weeks to months. 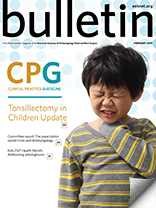 For medically appropriate patients desiring a shorter duration of treatment, vocal fold augmentation can be considered. In this process, bulk is added with either an injected filler material or a surgically placed implant. Various quality of life studies show that patients with these concerns are often quite happy with the results they achieve with treatment. These patients find they withdraw less from social engagements and find everyday communication to be much easier.